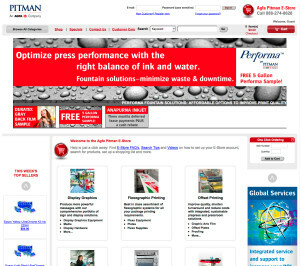 Integrated Marketing Services (IMS) helped Agfa Pitman, a leading graphics communications manufacturer and distributor, increase sales by redesigning its E-Store making it easier to use, easier to locate products and more convenient to check out. The IMS E-Store redesign won the prestigious Stevie® award, the Oscars of graphic design, the second recent Stevie for IMS. The goals of this redesign were to enhance user experience, generate leads and increase purchases so sales staff could handle more complex sales. After the redesign, IMS marketing promoted the E-Store in print and online, and created a user’s guide making content easier to use and more effective. The result: an increase in total sales, average-order amount and average number of sales per customer.